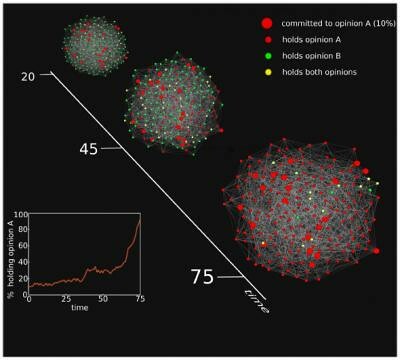 In this visualization, we see the tipping point where minority opinion (shown in red) quickly becomes majority opinion. Over time, the minority opinion grows. Once the minority opinion reached 10 percent of the population, the network quickly changes as the minority opinion takes over the original majority opinion (shown in green). Read the full story at Physorg.com. As we dress for the Tea Party, we might recall that it was on this date in 1974 that President Richard M. Nixon released subpoenaed White House recordings after being ordered to do so by the Supreme Court… well, sort of: six days later, on August 6, the White House released another tape, recorded days after the Watergate Break-in, on which it was clear that the President knew of the burglary and conspired in the cover-up. 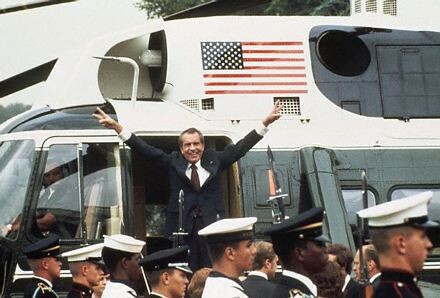 Nixon resigned on August 8.